For the past several years, race fans around Kansas City have been asking for a B-Mod class at Lakeside. They’re a little less expensive (which isn’t saying much, because racing is expensive no matter what you drive) than the regular Modified class, and there are lots of these cars running at tracks all over the area. So finally, Lakeside caved-in and allowed them—mostly. 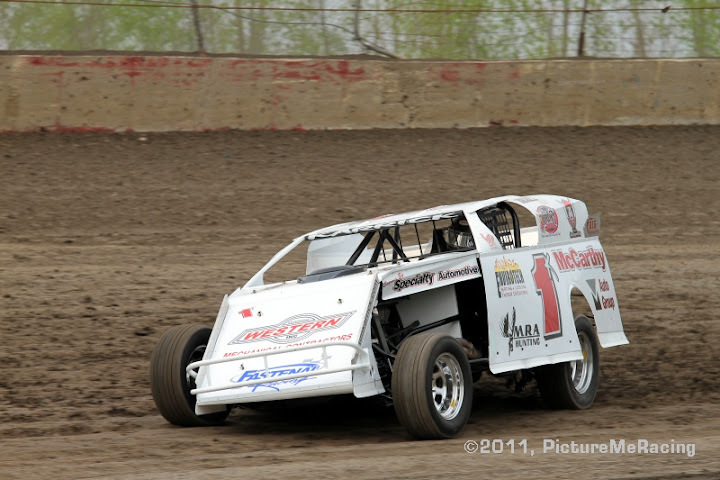 One of the concerns was that these cars would look too close to the Modifieds people have come to know and love, so the new cars are run sans roofs. 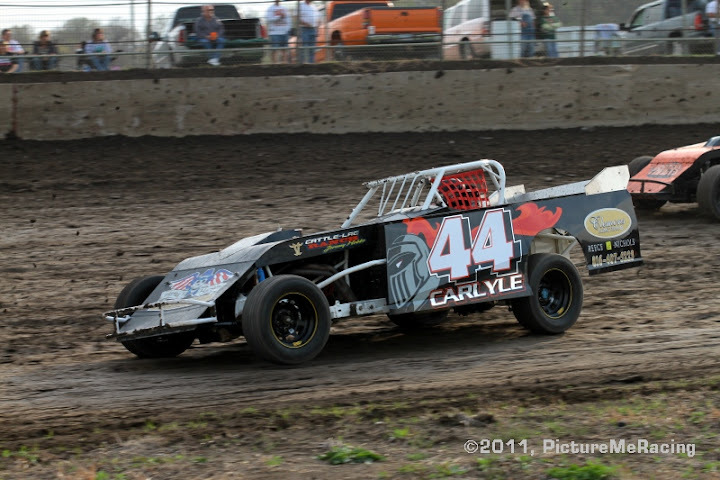 So the first winner in the new Convertible B-Mod class was … drum roll, please … Troy Carlyle from “No Hometown Listed”! OK, even though the press release didn’t know where the guy was from, he looks pretty happy in the pictures, and he beat several Lakeside veterans and work his way up from the 9th starting spot to pull this off. The premiere class at Lakeside is the traditional Modified class. And every year, the best cars are faster and more sophisticated. Tim Karrick, who certainly isn’t a stranger to Lakeside’s victory lane, pretty much ran the table by winning both his heat race and the feature. Karrick’s new car isn’t the best looking thing aesthetically that he’s ever showed up with, but obviously, when it comes to dirt track stock cars, you can’t judge a book by its cover. Tim Shields stormed to the early lead of the Grand National feature, then his on-track archrival Tim Billings was able to get through traffic and run him down. 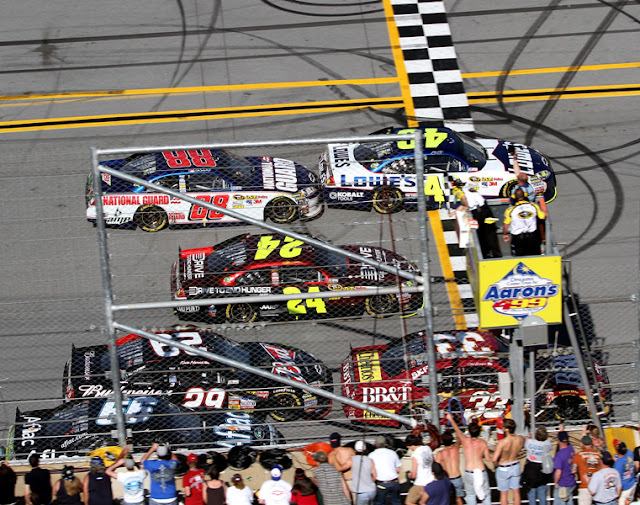 The two Tims swapped the lead back and forth, but eventually Shields found his way back to where he started to take the checkered flag. 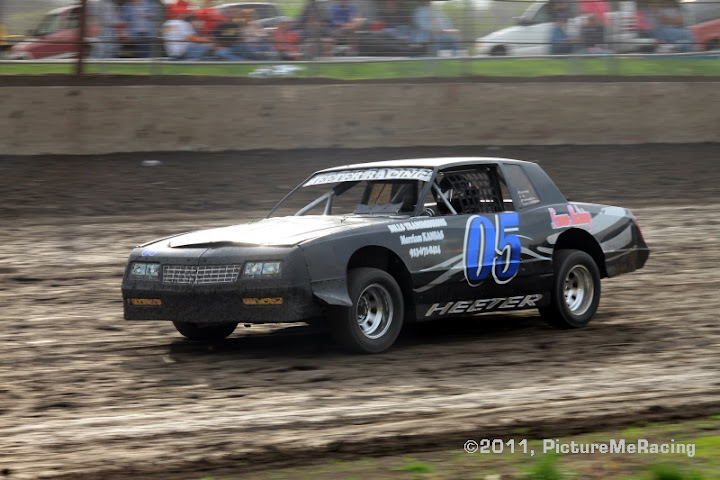 2009 Lakeside Factory Stock champion Brett Heeter won his feature from the fourth spot. A former Lakeside Speedway Modified driver made a little history at the Sprint Cup Race in Talladega, Ala., on Sunday as well. 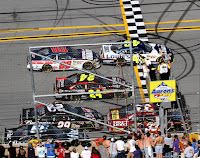 Clint Bowyer from Emporia, Kan., nearly won the event by deftly manipulating the “two-car-tango” racing strategy throughout the day, but it was five-time consecutive and defending Sprint Cup champion Jimmie Johnson who just nipped him at the line with a push from his teammate, Dale Earnhardt, Jr. Johnson’s victory over Bowyer tied for the closest finish ever recorded in NASCAR Sprint Cup competition, equaling the spectacular victory that Ricky Craven put over on Kurt Busch at Darlington in 2003. 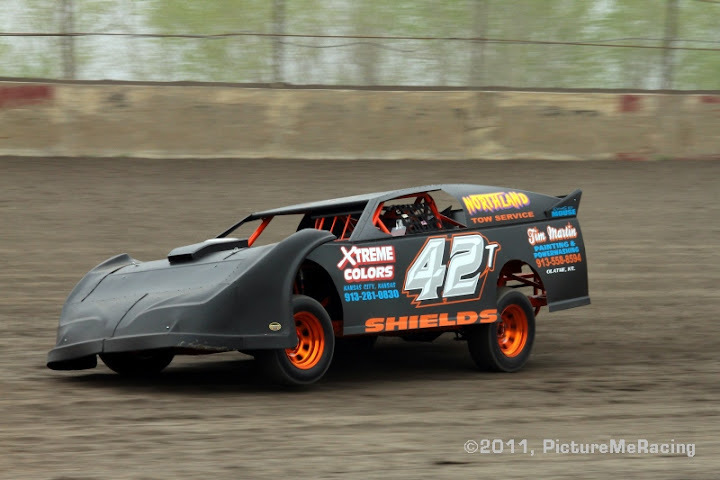 Look for more racing action at Lakeside Speedway in Kansas City, Kan., this Friday night, April 22. To learn more, visit http://www.lakesidespeedway.net/. Results below the slideshow. Lakeside pictures courtesy of http://www.picturemeracing.com/. 1 2 1K Tim Karrick, Basehor, Kan.
2 1 39 Luke Driskell, Stilwell, Kan.
3 4 96 Chad Lyle, Oak Grove, Mo. 4 10 70 Aaron Marrant, Orrick, Mo. 5 24 13 Joe Walker, Harrisonville, Mo. 6 8 68 Kerry Davis, Parkville, Mo. 7 17 8 Mark Hoover, Maryville, Mo. 8 5 0 Joe Cobb, Kansas City, Kan.
9 3 34A Jason Bodenhamer, Centerview, Mo. 10 11 01 Kirby Stiens, Conception Junction, Mo. 1 1 42T Tim Shields, Kansas City, Mo. 2 7 25 Tim Billings, Liberty, Mo. 3 12 51M Mike Ryun, Pleasant Valley, Mo. 4 2 42 Gene Claxton, Kansas City, Mo. 5 9 28D Gary Donaldson, Liberty, Mo. 6 5 181 Luke Nieman, Nortonville, Kan.
7 15 3E Kelby, Ostrander Oskaloosa, Kan.
8 4 2M Jeff Miles, Kansas City, Kan.
9 6 11T Mike Taylor, Jr., Gladstone, Mo. 10 11 9 Don Marrs, Shawnee, Kan.
1 4 05 Brett Heeter, Kansas City, Kan.
2 2 19 Jay Barnes, Kearney, Mo. 3 17 46 David Holcomb, Kansas City, Kan.
4 9 44 Henry Mabe, Desoto, Kan.
5 19 33 Phil Snodgrass, Kearney, Mo. 6 16 T2 Tom Fogarty, Olathe, Kan.
7 18 17 Kevin Mcginnis, Kansas City, Kan.
9 15 3 Don Johnson, Kansas City, Kan.
10 7 3B Darrin Christy, Kansas City, Kan.
2 8 20T Mike Tanner, Kansas City, Mo. 3 1 14W Bobby Wood, Rayville, Mo. 4 2 57S Royce Stanley, Jr., Kansas City, Mo. 5 6 42 Gene Claxton, Kansas City, Mo. 6 12 05 Troy Garner, Belton, Mo. 9 16 74 Rodney Schweizer, Kansas City, Kan.
10 13 17 Dean Galvan, Bonner Springs, Kan.